TripAdvisor ranked The Art Institute of Chicago one of the top five museums in the world in 2017. Paste Magazine praises Chicago theater as “one of the most thriving theatre scenes on the planet.” Condé Nast Traveler calls Chicago the “best restaurant city in America” (2017). Bon Appétit magazine agrees, saying Chicago is “America’s most exciting city to eat in right now,” and dubbing it the “Restaurant City of the Year 2017." In fact, 25 Chicago establishments were awarded one or more Michelin stars in 2018, which kinda proves the point. Here’s why Chicago remains the City at the Top. Celebrities from Justin Timberlake to Barack and Michelle Obama flock to Chicago’s Alinea for their seasonally driven tasting menu, consisting of between 18 and 22 courses, with mesmerizing theatrics and even pyrotechnics to accompany the experience. It’s performance art for food. Alinea has been named the “Best Restaurant in the World” by many, including Elite Traveler magazine. And it’s been awarded the top 3-star rating by Michelin Guide, which is only given to a dozen restaurants around the globe. What’s more, it’s been recognized by the James Beard Awards in many categories, including best chef for Grant Achatz and best overall restaurant. Just this past May, Abraham Conlon of Fat Rice won the coveted James Beard Award for Best Chef: Great Lakes, applauded for his acclaimed Logan Square restaurant. Oh, and did we mention that Chicago plays host to the James Beard Awards, dubbed the "Oscars of the food world" by Time Magazine, and will continue to do so through 2021? The Macau connection continues at The Ladies Room, a sultry speakeasy concealed within the restaurant. Chicago Magazine named it one of “Chicago’s 50 Best Bars” for a reason. 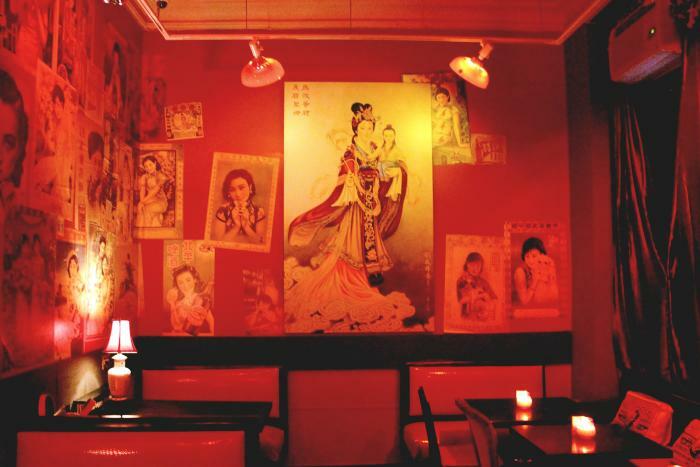 Subdued vermillion lighting, vintage pin-up art and 1920s Chinese decorations draw their inspiration from Macau’s red light district, making the space irrepressibly fun, exotic and exclusive. You’ll also find a board game at every table, reinforcing the Chinese gambling hall theme. And finally, the gypsy spirited Band of Bohemia, the first brewpub in America to earn a Michelin star rating. 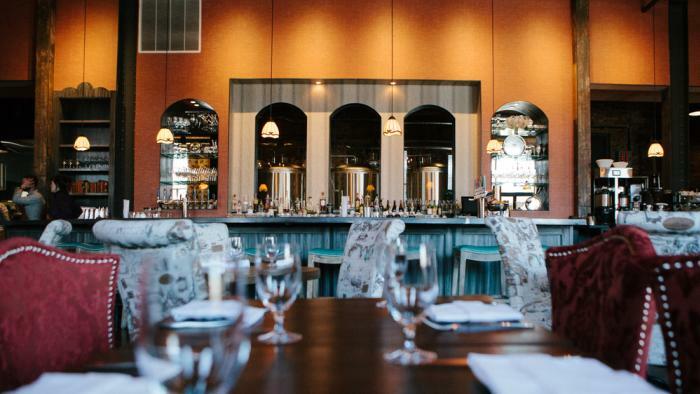 One of Chicago’s many acclaimed breweries, Band of Bohemia’s menu tantalizes with “utterly unique creations both in the glass and on the plate,” Michelin Guide comments. For a taste of both Band of Bohemia’s brews and cuisine, grab a $15 sampling ticket ($20 at the door) for Chicago Friday Night Flights’ August 3 Ravenswood Corridor event (4700 N Ravenswood). Band of Bohemia will be one of approximately 15 breweries offering up 3oz pours of their latest creations. And best of all, the brewpub will be providing all the food. 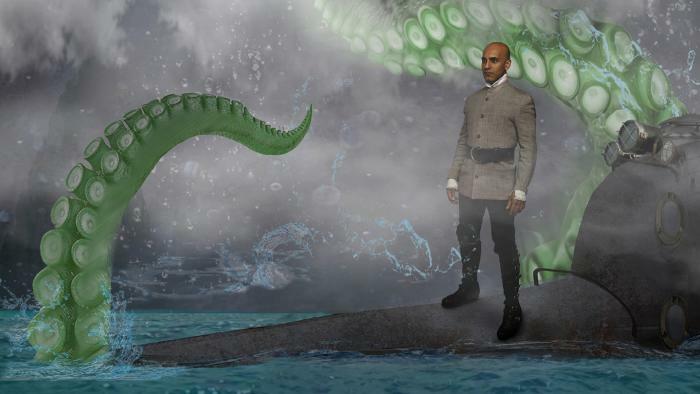 Theater: 5 Tony Award-winning Companies & "THE YARD"
20,000 Leagues Under the Sea, playing at Lookingglass Theatre Company now through August 19. Check for half-price tickets at Hot Tix! Chicago boasts an unprecedented five Tony Award-winning regional theater companies: Steppenwolf Theatre, whose ensemble includes (among others) Amy Morton, K. Todd Freeman, Laurie Metcalf, Joan Allen, Gary Sinise, Tracy Letts and John Malkovich, the Goodman Theatre, the Grand Dame of Chicago theater founded in 1922, Victory Gardens Theater, which has a knack for finding playwrights who go on to major success (Kristoffer Diaz, Samuel Hunter, et al), Lookingglass Theatre Company, with company members David Schwimmer and prolific character actor Joey Slotnick, and Chicago Shakespeare Theater, home to a 170-seat black box space, 500-seat Courtyard Theater (inspired by The Globe and the Royal Shakespeare Company’s Swan Theatre), and the recently constructed The Yard. Designed by Charcoalblue and Adrian Smith + Gordon Gill Architecture, The Yard was completed in September 2017, ushering in a new milestone in theatrical architecture. 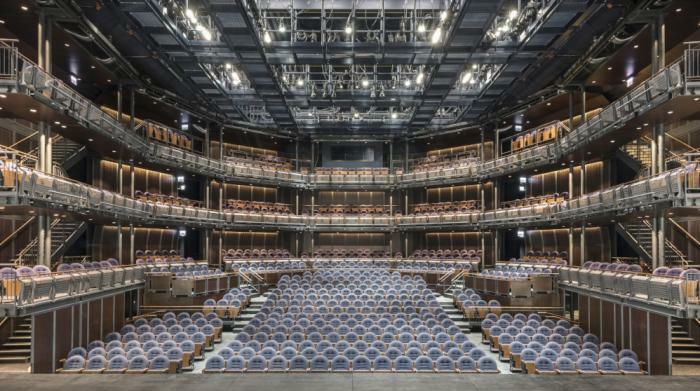 The 33,000-square-foot expansion features nine audience seating towers, each the size of a London double-decker bus standing upright. The towers can seat audiences ranging from 150 to 850 depending on the configuration, which is ever changing. GayCities named the Chicago neighborhood of Boystown the “Best of Gay Cities 2017, Best Neighborhood.” Out Traveler backed up the honor by naming Boystown the “Best Gay Neighborhood in the World.” It is, in fact, one of the first US gay neighborhoods to be recognized, and Chicago itself boasts the first legally recognized gay rights organization in the United States, established in 1924. 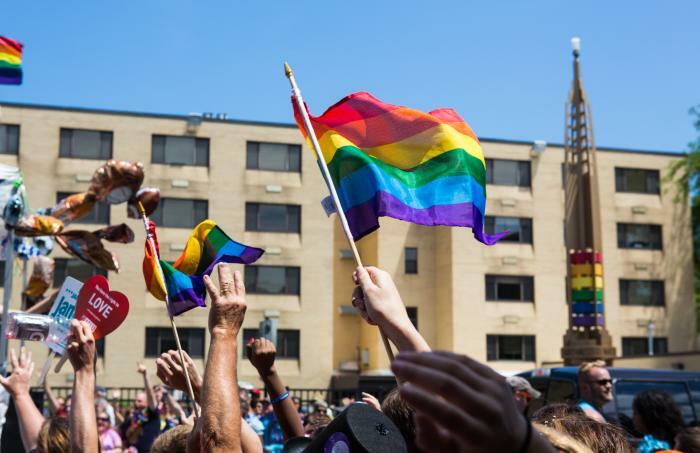 In celebration of Pride Month, improv star-maker Second City (think Bill Murray, Tina Fey and Stephen Colbert) is putting on Let’s Make It Perfectly Queer: A Salute to Pride. As Second City puts it, "Celebrate all things Pride in this rainbow of classic and original sketches with an inclusive cast that’s ready to question everything…except their comedic orientation." The show runs through June 24 on select days. Tickets are $20 ($15 for students). 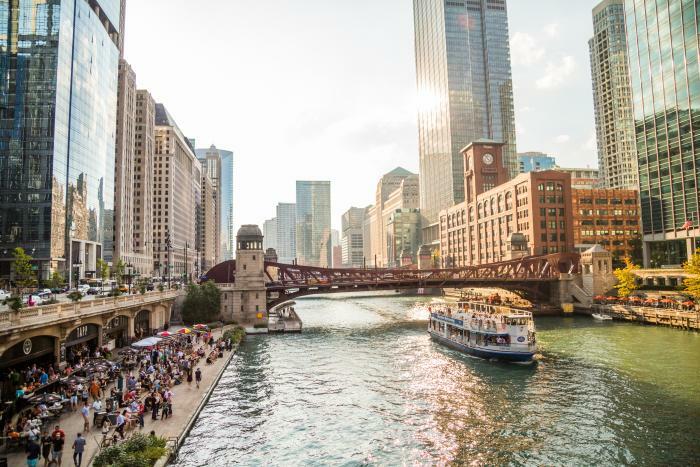 Whereas Lake Michigan is called the city&apos;s front yard, the 1.25 mile long (2km) Chicago Riverwalk that cuts through downtown Chicago between Lake Michigan and the confluence of the Main Stem, North Branch, and South Branch of the Chicago River might well be called the city&apos;s heart. The ever-increasing lineup of vendors for 2018 offers dining, live entertainment, kayaking, boat rentals, cruises, educational and cultural programming and public art all along the waterfront. 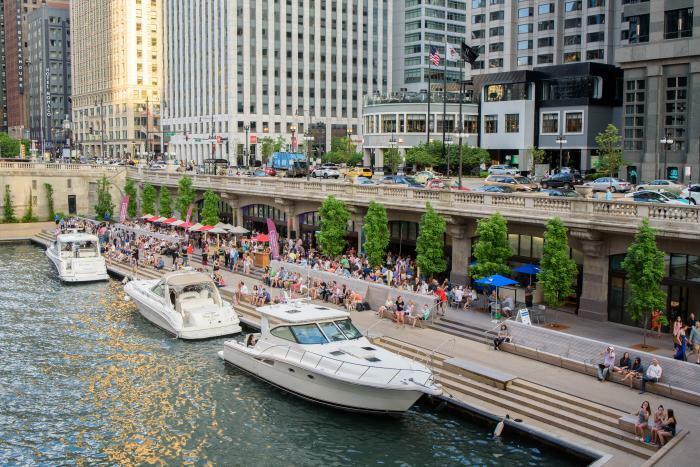 New projects in the works for the Riverwalk include Art on theMART, a new large-scale architectural projection project on the south facade of theMART (formerly known as the Merchandise Mart) scheduled for early fall, and an upscale restaurant, RPM On The Water, scheduled to open in 2019. 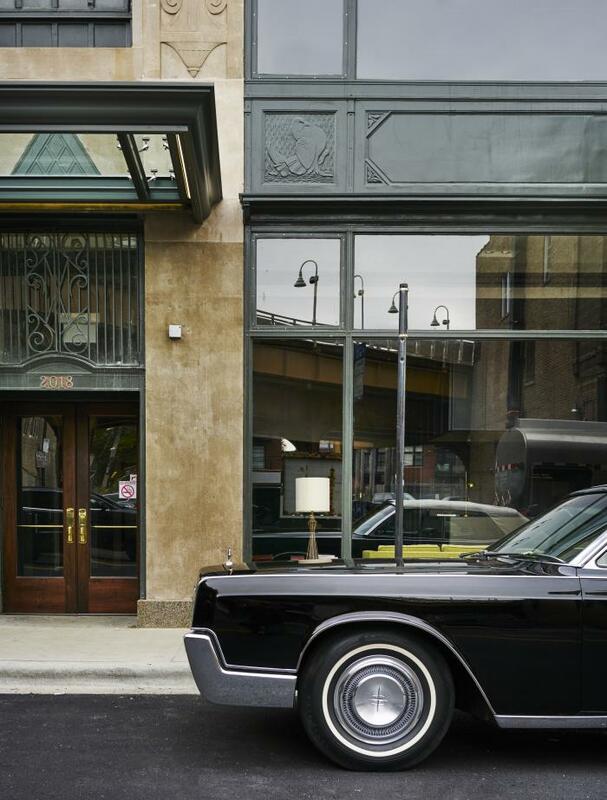 If you’re looking for a real taste of Chicago, run don’t walk to Chicago’s hotel hotspot, The Robey. Open since 2016, the completely renovated 1920s office building at the six corners intersection of Damen, Milwaukee and North Avenues in the Wicker Park and Bucktown neighborhood is one of a kind. 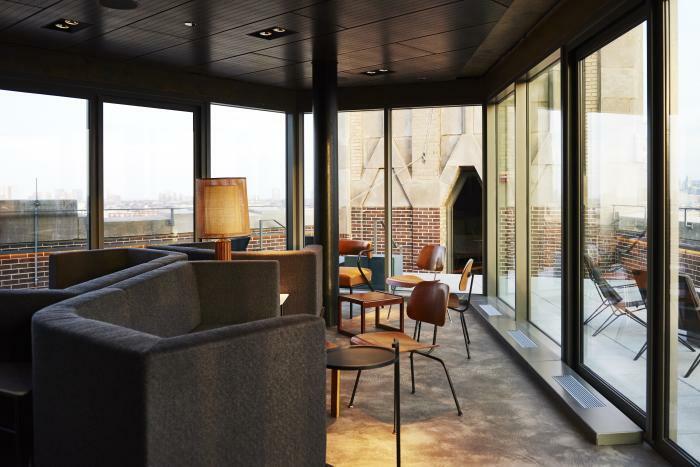 Voted one of Travel + Leisure&apos;s "Best New Hotels in the World for 2017," the building&apos;s shell dates back to 1929 when it was known as the Coyote (its spire gives the impression of a coyote howling at the moon). Inside, the hotel offers 69 Tower Rooms plus 20 Annex Lofts; the chic Café Robey with seasonally inspired delicacies prepared by Executive Chef Kevin McAllister; the Cabana Club, a rooftop poolside summer oasis for imbibing and dining with views of the Chicago skyline; The Up Room, a rooftop lounge complete with “the Grotto,” an intimate, semi-private retreat housed within the building&apos;s spire, and the second floor Lounge that serves up crafted, one-of-a-kind cocktails, creative appetizers and a Live at the Lounge entertainment series. A laid back attitude, indie spirit, galleries, cafés, art studios, trendy restaurants, independent boutiques, bustling nightlife, street fashion, and live music venues surround the hotel and define the area. 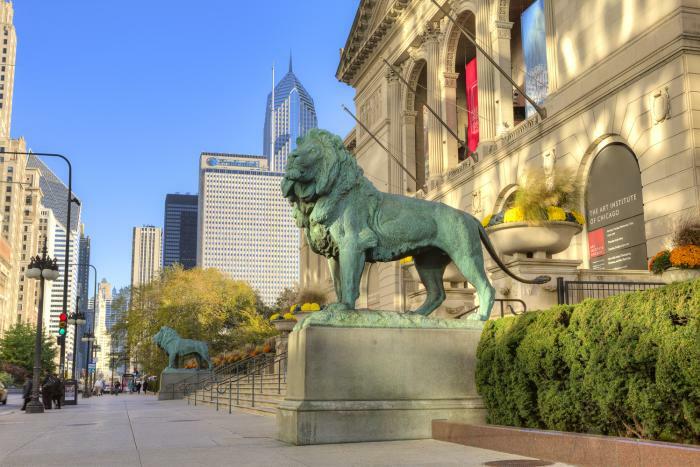 At the epicenter of Chicago&apos;s vibrant arts scene is the Art Institute of Chicago, which ranks right up there with the world&apos;s best, including The Metropolitan Museum of Art in New York, the Musée d&apos;Orsay in Paris and the Uffizi Gallery in Florence, Italy. Founded in 1879, the Art Institute is home to the largest collection of Impressionist and Post-Impressionist art outside the Louvre. The museum showcases more than 300-thousand art pieces in its collection, with works that span centuries, from Etruscan pottery and Ancient Greek reliefs to Pablo Picasso&apos;s The Guitarist, Edward Hopper’s Nighthawks and Marc Chagall&apos;s Windows. 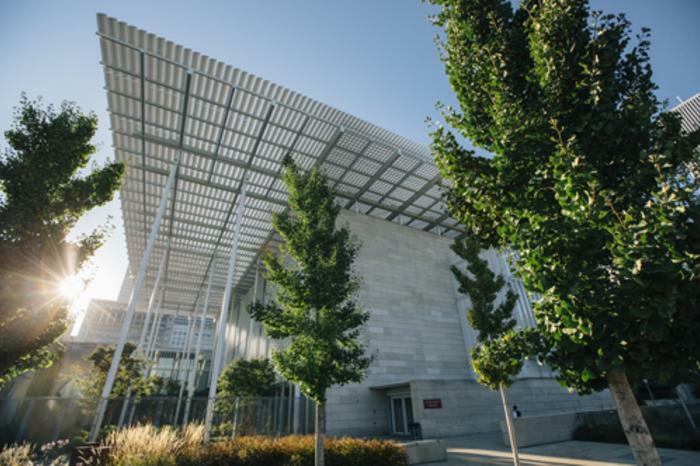 In addition to the original space, the museum’s Modern Wing, completed in 2009 and designed by Renzo Piano, is home to a collection of 20th- and 21st-century art, an Education Center, a contemporary gift shop and the Terzo Piano restaurant. 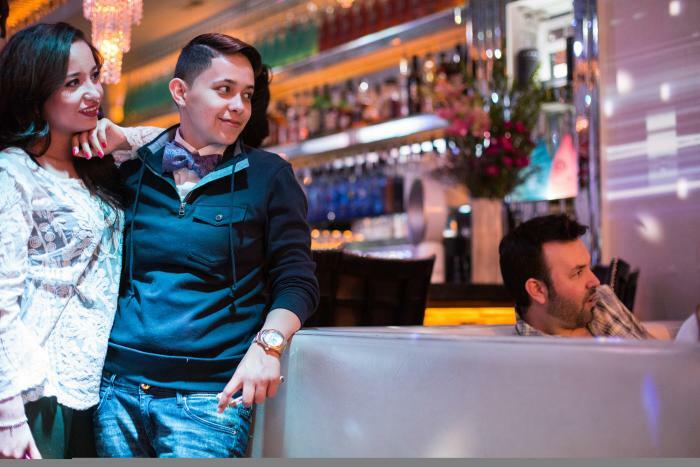 The restaurant offers clean contemporary decor and the signature cuisine of Chef Tony Mantuano and Chef di Cucina Carolina Diaz. The menu features fresh, local, organic and sustainably produced ingredients with a Mediterranean flair, complemented by a wine list that features top American producers alongside Old World favorites. In the summer guests can dine on the Bluhm Family Terrace, overlooking Millennium Park and the city skyline. TripAdvisor users rank the Chicago Architecture Foundation Center River Cruise Aboard Chicago’s First Lady as Chicago&apos;s #1 tour. So whether you live in Chicago or you&apos;re just visiting, it’s definitely a hot ticket. 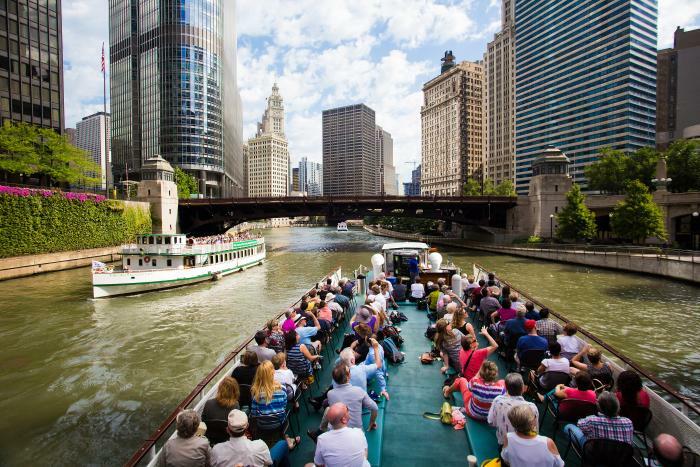 The 90-minute cruise led by highly trained volunteer docents from the Chicago Architecture Center shows off Chicago&apos;s world famous architecture, winding along the Chicago River all the way to Navy Pier. The tour covers 50-plus buildings, their architects and Chicago history. Chicago&apos;s First Lady is docked on the Chicago River just east of the Michigan Avenue bridge (112 E. Wacker). Tickets can be purchased at the dock (if available) or reserved ahead of time online.